Three young adults from Broward County, including a pair of sweethearts who had dated since their preteen years, died Sunday in a crash in Tallahassee. Tallahassee Police say 22-year-old Kevin Boos, 21-year-old Morgan Carr and 22-year-old Vincenzio Libio were traveling in a PT Cruiser when they were struck by a black Dodge Challenger as it attempted to make a left turn. Boos was pronounced dead at the scene, while Libio and Carr both died at the hospital. The driver of the PT Cruiser, 20-year-old Nikolas Bonilla, was taken to the hospital with non-life threatening injuries. The driver of the Challenger that struck them, 27-year-old Stanley Jaboin, was also taken to the hospital with non-life threatening injuries. An investigation into the crash is ongoing. It is not known whether Jaboin will face any charges related to the crash. According to a GoFundMe page established by the victim's families, Libio and Carr were middle school sweethearts dating since the age of 13. Both were alumni of J.P. Taravella High School in Coral Springs. Upon hearing of their deaths, Taravella principal Shawn Cerra tweeted "your time was short but you left an impact." 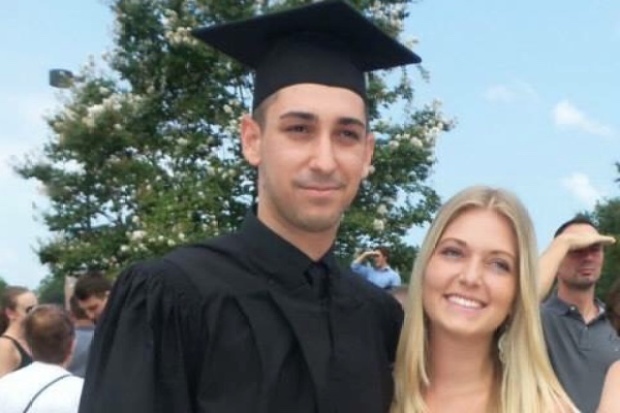 My thoughts and prayers go out to the families of 2 JPT Alumni, Morgan Carr and Cenzo Libio. Your time was short but you left an impact. According to the GoFundMe page, Carr was a senior at Florida State University in Tallahassee and was pursuing a career in marketing. She was also a member of the Zeta Tau Alpha Sorority on-campus. Libio had just graduated with a degree in sports marketing, and was making preparations to embark on a career with the NFL. According to Boos' Facebook page, the Tamarac native was also a student at Florida State University. Boos recently served as co-president of Epsilon Sigma Alpha at the school, and was remembered for his positive attitude and bright disposition in a post to the foundation's Facebook page. "For those of you who never had the opportunity to meet Kevin, our only regret is that you will not fully understand what a blessing he was to have in all of our lives," wrote the foundation's president, Christine Mucci. A GoFundMe page established by a friend of Boos's describes him as someone who "got along with everyone that crossed his path" who had a bright future ahead of him. "You have made an incredible impact on me and will continue to do so for the rest of my life. Rest easy, Kdog," the page organizer says.